What is Inkybay Product Customizer? Inkybay Product Customizer is a tool that lets businesses offer configurable products. The application is a rich web-based tool perfect for ready-to-print ready-made or personalized designs. With Inkybay, shops give their customers the ability to configure their designs. This enables them to retain their e-shop visitors who are looking for specific products with a high chance of converting them into paying customers. Furthermore, Inkybay is not limited to the usual apparel merchandise. With this tool, businesses are able to expand their offerings to phone cases, bicycles, windows, and more. Moreover, Inkybay makes it easy to manage back-end tasks. It is equipped with an admin panel where shop owners and permitted users to organize design-related paraphernalia, manage printing methods, prepare quotes, and perform other tasks. Inkbay Product Customizer lets businesses design merchandise to reflect their branding. It is armed with rich and powerful tools that assist users in creating designs with little to no errors and products that sell. This leads to reduced design time and to increased profit. Moreover, Inkbay is a tool that can be used to design any kind of product. It works on apparel, mugs, stickers, phone cases, and more. This flexibility allows businesses to offer a wide range of products to cater to a broad customer base. Sometimes, customers want a design not available in the store or want their product personalized. Instead of them going elsewhere for that, businesses are able to provide a platform that can cater to their needs. Inkbay has a tool that enables multi-layer or multi-panel product configuration and offers unlimited combos. This can be utilized for multi-panel team jerseys or even for bicycles. And while customers are personalizing their chosen merchandise or design, they are able to view changes they make in real-time. This feature lets them see exactly what they are getting. This way, e-shops attract customers with more buying options. E-shop owners can opt to set-up additional fees for product customization. This can be based on different printing types, product size, color, and more. This price can then be seen by the customer in real-time as they further customize their chosen products so they are not surprised at the checkout page. This transparency is attractive to consumers since they can set a budget limit for their customization. 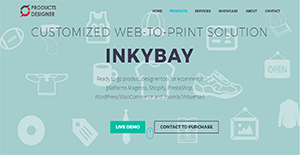 Inkbay Product Customizer seamlessly integrates with businesses’ chosen e-commerce platforms. Whether they are pre-existing accounts or new ones, the tool works with them flawlessly to offer a smooth commercial experience. With Inkbay, customers can upload their own photos in different formats to the system. They do not even need other photo editing software to doctor photos—rather, they can do it within Inkbay with the help of the application’s editing features. All design-related paraphernalia are always made ready-to-print with Inkbay. This ensures that stores are quick to answer to customers’ requests or demands. Even product management is a feature that is included in Inkbay. With its intuitive admin panel, shop owners and other users are able to configure their product offerings without much effort. This saves them time performing administrative tasks so they can focus more on coming up with new designs and products. What Problems Will Inkybay Product Customizer Solve? In the personalized product industry, it usually is the company that takes care of applying customers’ specifications on the chosen merchandise. This is very time consuming and is prone to a lot of errors. Inkybay Product Customizer does away with this by letting businesses integrate a personalization tool in their e-shops. This allows the buyers themselves to customize their preferred product and tailor it according to their envisioned design. By giving them this capability, shops save on production costs and can attract more customers due to their flexibility. Usually, customers have to request a quote from the service provider before they can proceed with production. This process takes a lot of time and can cause delays on both sides. With Inkybay, e-shops are able to show customers instantly how much they have to pay for their chosen product and design. This allows them to configure their designs to lower down the costs and make them fit their budget. Creating production-ready files is a time-consuming process as well as a costly step. Inkybay assists companies in decreasing time and money spent by instantly creating ready-to-print files. They no longer need to edit them—rather, they can immediately send the designs to the printers for them to commence production. If you are interested in Inkybay Product Customizer it could also be beneficial to check out other subcategories of Best eCommerce Software collected in our database of B2B software reviews. Since each organization has particular business needs, it is sensible for them to refrain from searching for a one-size-fits-all perfect software solution. Needless to say, it would be futile to try to find such a system even among market-leading software platforms. The smart thing to do would be to catalog the various important elements that need consideration such as required features, finances, skill levels of staff members, company size etc. Then, you should do your groundwork thoroughly. Read some Inkybay Product Customizer reviews and check out each of the other apps in your shortlist in detail. Such exhaustive research can make sure you reject ill-fitting applications and zero in on the app that presents all the aspects you require for business success. How Much Does Inkybay Product Customizer Cost? We realize that when you make a decision to buy eCommerce Software it’s important not only to see how experts evaluate it in their reviews, but also to find out if the real people and companies that buy it are actually satisfied with the product. That’s why we’ve created our behavior-based Customer Satisfaction Algorithm™ that gathers customer reviews, comments and Inkybay Product Customizer reviews across a wide range of social media sites. The data is then presented in an easy to digest form showing how many people had positive and negative experience with Inkybay Product Customizer. With that information at hand you should be equipped to make an informed buying decision that you won’t regret. What are Inkybay Product Customizer pricing details? What integrations are available for Inkybay Product Customizer? If you need more information about Inkybay Product Customizer or you simply have a question let us know what you need and we’ll forward your request directly to the vendor.